Place some coarse salt onto a plate and moisten the rims of 2 glasses. Dip the rims into the salt and set aside. Slice lime into wedges for garnish. Blend ice cubes, tequila, triple sec, lime juice, and simple syrup in a blender until smooth. 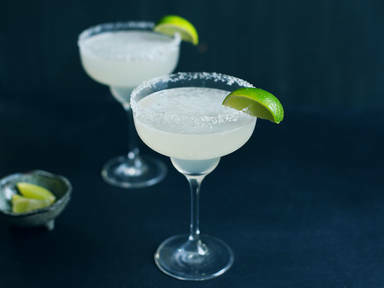 Fill glasses with margarita and garnish with a lime wedge or two. Cheers!